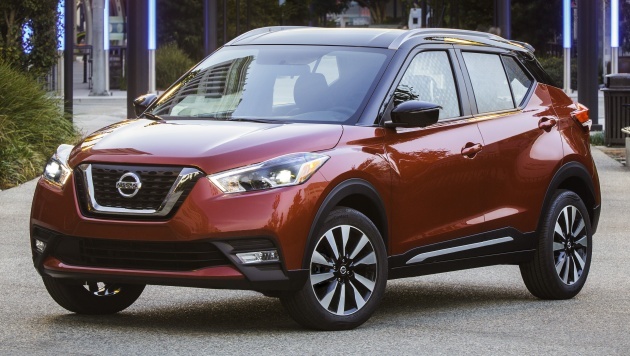 The Nissan Kicks continues on its expansion tour around the world – after debuting in Latin America and China, the B-segment crossover has now made its way to the United States, this time as a less polarising replacement for the quirky bug-eyed Juke. Its more homogenous looks are more in keeping with a market that sees people buying the Honda HR-Vs in the droves, with more conventional hawk-eye headlights flanking the Nissan V-Motion grille. The Kicks also joins in on the floating roof trend with blacked-out A- and C-pillars, while prominent wheel arch bulges emphasise the car’s stance. Boomerang tail lights complete the look. Available options include LED low-beam headlights with LED positioning lights, fog lights, heated exterior mirrors with integrated indicators and a rear roof spoiler, and there will also be a range of seven exterior colours and five two-tone combinations. The latter include white, orange and red with a black roof, grey with an orange roof and blue with a white roof. Inside, the Kicks bears more than a passing resemblance to the new March, which is no surprise considering that it’s based on the same (albeit uprated) V platform. 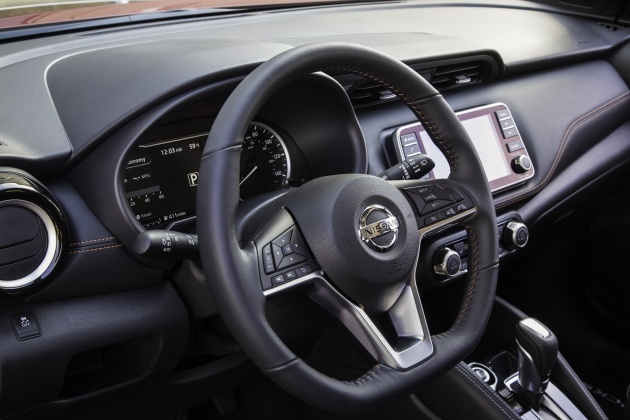 The “Gliding Wing” dashboard is dominated by a seven-inch infotainment touchscreen, available with Apple CarPlay and Android Auto connectivity. Nissan is proud of the Bose Personal Plus sound system on the SR Premium Package model, which adds eight speakers (including two UltraNearfield neodymium speakers in the headrest) and proprietary Bose signal processing for what the American audio company calls “360 degrees of immersive sound.” There’s also a six-channel digital amplifier and a customisable Bose PersonalSpace Control feature. Other features include standard-fit Automatic Emergency Braking (AEB) with Forward Collision Warning (FCW), seven airbags and reverse camera, plus an optional Intelligent Around View Monitor, heated Prima-Tex-upholstered front seats and automatic climate control. Nissan also boasts ample rear seat space as well as one of the largest boots in the class. Power comes from a 1.6 litre naturally-aspirated four-cylinder petrol engine making 125 hp and 156 Nm of torque, sent to the front wheels via an Xtronic CVT with an estimated fuel consumption figure of 7.1 litres per 100 km. Vehicle Dynamic Control (VDC) comes as standard, and the SR model throws in an Integrated Dynamic-Control Module (IDM) with Active Engine Brake, Active Trace Control and Active Ride Control. 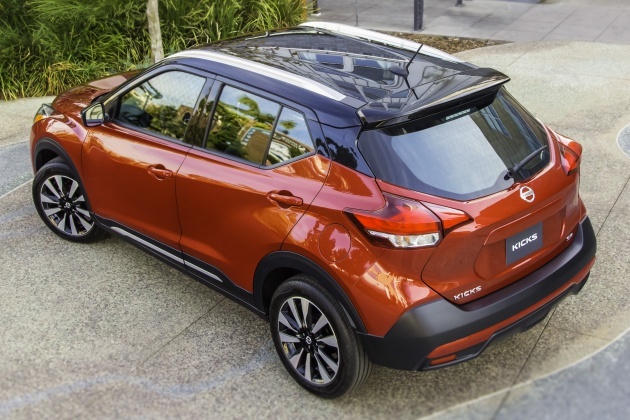 So what do you think of the new Nissan Kicks – is it a worthy rival to the Toyota C-HR, Mazda CX-3 and the all-conquering Honda HR-V, or has Nissan Kick-ed the Juke out of existence a little too soon? Sound off in the comments section after the jump. This err.. wow… it’s.. is it overdone with that V-motion thing?… Anyway, this cute bucktooth suv will probably only push up sales of maybe only 100 units per year if TCM ever bring it in… unless it’s paired with e-power then it will sell a lot more. Theres still more Ertiga than Sienta on the roads. Is ETCM still around? Will they sell this in this country if they are still in the business of selling cars? Its about time Nissan kick start them-self with this Kicks Crossover as its loooong overdue to replace their aging Nissan vehicles especially in M’sia. With Big H HRV selling like hot cakes in thousands, TCM is stupid NOT to bring in New vehicles unless they intend to closed shop like Susu-ki !! Yup. Ini semua salah ETCM for wrong market strategy, alwiz bring in the oldest & ugliest & most outdated models in Nissan lineup. If only the bosses at TC had realised to bring in models like Maxima, Pulsar, Kicks, March. By the time ETCM brings this in, all those who wanted to buy a HRV type car will alredi bought a HRV. If TCM really serious about SUV business here, they should bring in the Qashqai. I will take it anytime over the HRV. Nissan Kicks will sell only if the pricing is attractive enough. Qashqai not available in any ASEAN market except SG, and here they already have another C segment SUV, the Nissan X-trail. TC is a bao selling company! They are not very keen in selling car! Pathetic range of models in my! When is Tan Chong replacing the Almera? To be blunt, ETCM has got poor marketing and styling blind people. They bring in dated looking cars which was probably rejected by other countries. Their pricing strategy is very poor, trying to fight the more established brands like Honda and Toyota. Honestly, I don’t know who their target consumers are in Malaysia? Retirees? Uncles and Unties? Honda and Toyota wannabes?